On the first night of July 1994 Jeff Tobolski put himself and his Westwind 2 twin-engine jet nine miles above the Oklahoma-Arkansas border, just to the west of a gargantuan storm that was pummeling the ground below with baseballs of hail, heavy black sheets of rain, and enough bolts of lightning to turn the night almost to day. Usually Tobolski flies business executives from city to city, and usually he would not have brought his clientele anywhere near this particular point in space and time. But on this night he was piloting one of two jet loads of atmospheric scientists who would have flown right into the storm if they could have. We were flying for scientific discovery, and so, Tobolski remarks with considerable understatement, we were removing some of the typical caution. The researchers, most from the University of Alaska, had come on a quest for a new kind of lightning: towering, tendriled columns that rose above the thunderclouds, rather than below. Like other pilots, Tobolski had heard tales over the years of strange high-altitude flashes--he’d even seen some odd things himself--but he had never taken them very seriously. If you have some flash out of the corner of your eye, I often liken it to some cockpit light that caught the glare of the windscreen. And since it was out of the corner of my eye and since we’re not supposed to see things out there, I’d say I didn’t see anything. Yet the previous summer, the Alaskan researchers had managed to capture on video just such flashes, bursts of light hovering 20 miles above the clouds. This year they hoped to catch more, with a camera aimed through six-inch glass domes bulging from the sides of the aircraft. Flying over the Arkansas border that night, Tobolski focused on keeping his plane out of trouble. He flew above the storm, along the edge; with no moon, he depended on the gray glow of conventional lightning to illuminate the billowing black thunderheads from within. Above him, the sky was so clear that he could see the Milky Way and the lights of the other jet flying some 20 miles ahead. I happened to be looking right at the clouds because it was a rather roily storm, says Tobolski. As he looked, a cone of bluish white light rose from the top of the cloud and trumpeted 20 miles into the air in a quarter of a second. That’s strange, Tobolski thought, but he didn’t say anything. The lights that the Alaska researchers had seen the summer before looked more like titanic jellyfish or carrots, floating much higher above the clouds--nothing like what he had just seen. At another spot on the cloud a second burst rocketed upward. Did you see that? he asked his co-pilot. Just then the pilot of the other plane radioed, repeating Tobolski’s words. What is it? Tobolski radioed back. There was a pause while the pilot tried to get an answer from the scientists on his plane. Then the answer came. Whatever they were, the lights now began to fire by the dozens. Some sprayed like fountains, others raced across the sky like Roman candles. The people of Arkansas huddled miserably under these furious clouds, but nine miles over their heads a handful of people were hooting. It looked to us like the Fourth of July, says Tobolski. Five years ago most atmospheric scientists would have said Tobolski was hallucinating. A thunderstorm, after all, directed its energies down, not up. But as Tobolski discovered for himself, the upper atmosphere is a transparent jungle in which strange creatures are hiding. There are huge dancing carrots, salmon-colored trees, blazing rings wider than Rhode Island, strings of beads, and fountains powerful enough to release blasts of gamma rays and X-rays. Like zoologists who have stumbled into a region of undescribed species, meteorologists and physicists are trying to catalog the lights as fast as they can. It’s exciting, says Eugene Wescott, part of the University of Alaska team. You’re not just filling in the last decimal place in something well-known. This is completely new. Even as the explorers race after the elusive lights, theorists are racing to explain them. In the past year their models have matured from hand-waving gestures to impressive computer simulations. And increasingly the researchers suspect that the odd lights may be having an important global effect. They could be pumping energy from the ground to the wispiest regions of the atmosphere, creating belts of radiation that gird the planet, and endangering orbiting satellites. Ever since Ben Franklin flew his kite in a Philadelphia thunderstorm, scientists have been trying to understand how storms create lightning. A decade ago they thought they had the basics pretty well worked out: The process starts with violently swirling clouds in which powerful updrafts carry water and ice as much as ten miles into the air. As droplets and particles collide, they exchange charges, much as rubbing your shoes on a carpet builds up a charge on your clothes. For reasons that still aren’t clear, positive charge builds up on the top of a cloud and negative charge accumulates on its underside. The attraction of the negative charges concentrates positive charges on the ground below the cloud, creating an intense electric field between the two. The majority of lightning bolts are formed when this field becomes too intense, causing a channel of current to flow down from the cloud and join another coming up from the ground. The channels connect in a lightning bolt that drains some of the cloud’s charge. Although pilots sometimes reported seeing strange, enormous lights over thunderstorms, meteorologists could never confirm such sightings. Besides, no one could see how the physics of conventional lightning produced the lights. But serendipitously, in July 1989, a group of physicists from the University of Minnesota tested a new low-light video camera they had designed to ride on a rocket and take pictures of dim stars. They pointed the camera toward a thunderstorm over Lake Superior to see if it could record the distant flashes of lightning. When they looked at the film, they were shocked to find a huge smear of light rising up from the thunderhead instead of down. Three months later, orbiting shuttle astronauts also captured a tentacle of light rising from a cloud. We flew around for a lot of time, and there was a tremendous amount of lightning--just bang-bang-bang-bang! But watching in real time I didn’t see anything. We were disappointed when we went back to Alaska. Other people went through our data back there and didn’t see anything either. But Wescott went over the film again, and this time he saw a fleeting blob of light high above the thunderstorm. He had imagined that the film would reveal ordinary lightning bolts traveling up instead of down, but what he saw was something altogether different. Eventually we found 19 of the lights and convinced ourselves they were real. At the same time, another researcher, meteorologist Walter Lyons, now at Mission Research Corporation in Fort Collins, Colorado, was setting up cameras on a mile-high plateau in northern Colorado where he could look out for hundreds of miles at lightning storms rolling over the Great Plains. He collected hundreds of images of similar lights hovering over thunderstorms. The objects sometimes draped down long tentacles for tens of miles; sometimes they sported hairy heads; they appeared alone or in pairs; and in a tenth of a second they were gone. The following summer, in 1994, Lyons and the Alaska team returned to their respective posts and saw hundreds more of these lights--which Lyons has named sprites. Wescott and Sentman discovered that sprites are salmon-colored, and as they flew with Tobolski over the Arkansas storm that summer, they discovered that sprites were not alone above the clouds: fountains of blue light emerged directly from the clouds as well. These they named blue jets. The rush of discoveries attracted dozens of scientists to Lyons’s summer aerie in 1995 and 1996, and the discoveries continued to pile up. In the early 1990s, for example, satellites had registered intense gamma rays shooting upward from somewhere in the atmosphere. Recent measurements now tie them to thunderstorms and most likely to sprites and jets. Most remarkable were readings registered by Japanese light sensors that showed that far above the thunderheads, jets, and sprites, brilliant rings of light were forming for a thousandth of a second, reaching 200 miles across. Scientists soberly named the rings emissions of light and very low frequency perturbations due to electromagnetic pulse sources. Usually, though, they refer to them as elves. What could possibly cause all this commotion above the clouds? Physicist Umran Inan and his fellow researchers at Stanford’s Space, Telecommunications, and Radioscience Laboratory (better known as the Star Lab) have come up with some intriguing explanations. Since the late 1980s, Star Lab researchers had been studying how lightning bolts affect the surrounding air. They had found that if a bolt is powerful enough, the sudden flow of electricity releases a burst of electromagnetism in the form of radio waves, which radiate upward and outward from the bolt in an expanding cylinder. In a few hundredths of a second the waves rise to a thin, high layer of the atmosphere that is full of free electrons. There the radio waves can give those electrons a boost of energy; when the energized electrons plow into a nitrogen molecule, the molecules give off light. Thus an elf might be born. The researchers also have an idea how a red sprite might be created. As a thundercloud charges up in the minutes before releasing a lightning bolt, the positive charges in the top of the cloud attract a cluster of negative charges in the atmosphere just above. Thunderclouds form in the midst of turbulent atmospheric conditions, and it sometimes happens that winds spread the top of a cloud out beyond its base. The result is that the positive charge on the cloud’s top is exposed to the ground below. There, negative charge is drawn to the surface, creating another electric field. A lightning bolt may then suddenly leap from cloud top to Earth, but instead of draining off the negative charge on the cloud’s underside, this one strips away the positive charge on top. Unlike normal lightning, such cloud-top bolts have a brief but powerful effect on the atmosphere above. When the bolt suddenly siphons off positive charge from the top of the cloud, the negative layer in the air above is left behind. This immediately sets up a vast electric field that stretches from the cloud to the top of the atmosphere. This large field accelerates electrons that are just hanging around, explains Inan. The electrons bang into nitrogen molecules, which give off energy in the form of light, most of which is red. Thus a sprite is born. As the sprite is forming, positive charges in the atmosphere are gradually attracted to the layer of negative charge above the cloud, and when they neutralize it the entire field collapses. But for a few hundredths of a second, enough electrons crash into nitrogen to sustain a fantastic creature of light. Blue jets, by contrast, don’t need any lightning to get started, says Inan. If a cloud is stirring itself with particular violence, a few patches on the top may become so intensely positively charged that a spark is created between the patches and the negatively charged air above. This spark strips off some of the electrons in the air just overhead, and in doing so it begins to act like a lightning rod, drawing surrounding charged particles toward it. In a kind of domino effect, the channel of current keeps stretching upward as charged parcels of air sequentially break down to form a growing column full of current. Electrons in the current collide with neighboring nitrogen molecules, releasing a glow much like that of a sprite--with one key difference. Because the atmosphere just above the clouds is so relatively thick, molecules collide with each other much sooner than they do at higher altitudes. There isn’t enough time for photons of low-wavelength color--such as red--to emerge from the excited molecule; instead the molecule transfers its excess energy as heat instead of light. 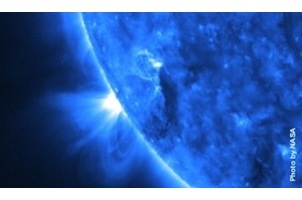 With the red photons removed, only shorter-wavelength light--in other words, blue--can be seen. Thus jets become blue. A fair amount of evidence is piling up in support of these Star Lab models. First, there’s the computer modeling: when the researchers simulate their hypothetical forces, they can generate on-screen what look like red sprites and blue jets. It’s also telling that the most frenzied fusillade of blue jets ever seen--the one witnessed by Tobolski over Arkansas--came from a storm that was hurling down hail the size of baseballs. Hailstones create intense electric fields inside clouds by mopping up electrons on their large surfaces. It’s conceivable that as a result the cloud tops were unusually high in positive charge, producing the blue jets. The Star Lab researchers also modeled elves on computers, but it was harder to compare the models with reality. Conventional video cameras can’t record quickly enough--elves last less than a thousandth of a second rather than the long hundredths-of-a-second life spans of jets and sprites. Light meters, on the other hand, could catch photons coming from the elves but couldn’t form an image. Star Lab physicists therefore built a hybrid of the two. They placed ten light meters inside ten open pipes and arrayed them in a line like a battery of cannons. Each light meter could thus soak up only the light coming from the small patch of sky the pipe was pointed at. By comparing the timing of each light meter’s response, the researchers could reconstruct the movement of an elf. They took the apparatus (which they named Fly’s Eye) to Lyons’s station in northern Colorado in 1996 and pointed it at dozens of elves. We successfully predicted their speed, their motion, the whole thing, says Inan. The elves were narrow rings that were born just after lightning bursts and raced outward as their models had said they would. It would be fascinating if you could see it. There would be the flash on the ground and then nothing for 60 miles and then suddenly something expands laterally, says Inan. It would really look quite unnatural if your eye was able to follow it. A theory that’s consistent with the facts may not necessarily be right, though. Some researchers think there may be a simpler way to create the lights. Physicist Robert Roussel-Dupre of Los Alamos National Laboratory points out that our atmosphere is continually peppered with high-energy charged particles from outer space known as cosmic rays. Each cosmic ray that travels through the air sooner or later knocks into a molecule and frees an electron, passing on to it much of its vast energy. Say a lightning bolt has just drained the top of a cloud of its positive charge. As the Star Lab researchers have shown, an electric field suddenly appears for a moment between the cloud top and the upper atmosphere. If a cosmic ray should happen to hit a molecule just above such a cloud, its liberated electron would travel upward in the electric field, carrying with it the ray’s cosmically high energy level. It would ram into other molecules so violently that it would loose an avalanche of more electrons, all flowing upward. Some of the collisions would produce lower- energy electrons that would make nitrogen molecules glow and, depending on just how far above the cloud the collision took place, create a jet or a sprite. At the same time, some collisions would produce higher-energy electrons that would carry the beam skyward, and at their high speed they would spontaneously give off a range of photons, including the gamma rays that have been detected by satellites, as well as radio waves. These radio waves would radiate from the beam in an expanding cylinder and create a ring-shaped light in the upper atmosphere--in other words, this beam would create an elf. Roussel-Dupre has evidence of his own to point to. He has built simulations of this process with his colleagues at Los Alamos, and they’ve been able to create light phenomena of the right size, shape, altitude, and color. Given the roughly equal success of his model and the one from the Star Lab, Roussel-Dupre thinks his wins because it’s less contrived. They need an electric field that’s ten times stronger than ours, he claims. My opinion is that will never happen. It’s really stretching things. By contrast, cosmic rays can create an avalanche of electrons in a relatively low-intensity field. It just wants to happen. The next few years may show whether the truth is closer to Inan’s model or Roussel-Dupre’s, or if it is in fact a mix of the two. But whatever the answer turns out to be, it will change the way we understand our atmosphere. Before sprites and other lights were discovered, scientists thought that the energy contained in weather systems kept close to the ground. But apparently these lights have been secretly funneling much of the electric currents created in thunderstorms all the way to the top of the atmosphere--and all over the world. You can fly around in the United States and see them, but how important are they? asks Wescott. They’re important only if they’re a component of all the thunderstorm regions of the world. In 1995 Wescott and Sentman returned to the Amazon--one of the busiest lightning regions in the world--and were able to record copious sprites. It appears that they are indeed firing off at a global scale. If Roussel-Dupre’s model is correct, he suspects that the beams of electrons may blast their way out of the atmosphere altogether. That would mean that they are conceivably an important source of the charged particles that fill the magnetosphere--which researchers have generally assumed gets its supply only from the sun. If so, then sprites could pose a hazard for satellites by firing their high-energy beams at their delicate sensors. And what goes up in this case must come down: a beam of sprite- generated electrons would follow the lines of Earth’s magnetic field around the planet and back down into the atmosphere, where it might cause auroras. If a sprite flared in Kansas, its beam might create a glow in the sky somewhere in the Pacific. To establish what these lights are really doing, researchers will try to get even closer to them in coming summers. Plans are under way to launch high-altitude balloons in 1998 from the eastern edge of the Great Plains. If all goes well, they will be swept west by high winds and float over thunderstorms. With photometers, gamma-ray detectors, and other sensors, they will be able to make out many details of sprites and jets and elves that have thus far eluded researchers. Chances are they’ll also find something completely new. Recently, Wescott and Sentman have witnessed the sudden appearance of beads of light over thunderstorms. And from the ground, researchers have discovered a new class of sprites that look like fiery trees. Apparently the transparent jungle still has surprises for us.